Today was the first day of my 11-day summer furlough. I have to take (on average) one day every week for the next 11 weeks. My goal is to get some projects finished with my furlough time. However, today wasn’t the most productive day. But at least I got something done. I didn’t get started until about 10 AM. The morning was spent taking a load of bulky waste to the dump. Not the most glamorous of projects, but it makes a big difference at the house. After lunch I weeded the garden and worked on replacing the hinges in the kitchen. The door hinges in the kitchen are one of the (I’m sure many) small unfinished projects around the house. When we painted the kitchen, the hinges no longer matched. And they always looked like crap anyway. So a couple of weeks (or maybe months) ago I ordered new hinges. The hinges have been sitting on top of the refrigerator since they arrived. At least I didn’t lose the hinges (it is the little improvements that help). Today I took off the old hinges from the door to the sun porch. The new hinge screw holes didn’t line up perfectly with the old ones. 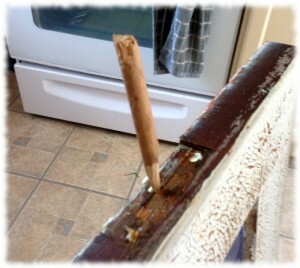 I took a small dowel and used a knife to whittle the dowel down to fill the hole. I hammered the plug into place with a little wood glue, and then drilled the holes for the new hinges. It took under an hour to replace both hinges and rehang the door.